Mark your calendars for Saturday, May 26, and line-up your teams for the Seventh Annual Alister MacKenzie Tournament at beautiful Sharp Park Golf Course in Pacifica, CA. With your help and support, we have time and again won political, legal, and administrative battles to keep the course open. But much work remains to renovate this 85-year-old diamond-in-the-rough: Plans to draw; Friends to make; Agencies to persuade; Work to do. So we’re still fighting, still fundraising, and we still need your financial support and involvement. Please join us – and bring your friends — to Sharp Park, Saturday, May 26. It’s great fun, and in case you missed it last year, check out our photo essay of the 2017 tournament. Download the entry form [ LINKED HERE ]. Sign-up your friends. Submit your entry forms, and pay by check or online. 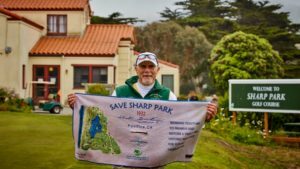 So come join us on May 26 to celebrate and restore the Alister MacKenzie legacy at Sharp Park!